The 2015 WFTDA Champion Rose City Rollers suddenly have a lot of extra motivation to make it two titles in a row. If they make it back to the finals, they’ll be playing in front of their home fans. That’s because the WFTDA has picked Portland, Oregon as the site for the 2016 WFTDA Championship tournament. After making their way through six playoff sites scattered around North America, the best 12 Division 1 and top four Division 2 teams in the world will make their way to the Rose City on November 4 to play for the trophy. That home field advantage worked very well for the Minnesota Rollergirls, who hosted Champs this past November. They took on heavily-favored Texas Rollergirls in the first round and almost beat them in the last jam, no doubt thanks to the boost the local crowd gave them. But hosting the tournament is no guarantee your team will be playing in it. Rose City, just like any top 40 WFTDA team hoping to take home the Hydra, will need to qualify by playing in one of four Division 1 tournaments in September and finishing with a top three placing. Those hoping to take home the Division 2 championship will need to be one of the two finalists in the two D2 tournaments in late August to advance to Portland. In a first for the WFTDA, two of the four Division 1 sites this year are outside of the United States—though still within North America. Terminal City in Vancouver and Montreal Roller Derby, Canadians each of them, will be giving the international playoffs a bit more of an international presence. The Columbia QuadSquad in South Carolina and the Mad Rollin’ Dolls of Madison, Wis. will host Division 1 tournaments on domestic soil. In Division 2, the ICT Rollergirls will kick off the playoff season on August 19 in Wichita, Kan. A week later in Michigan, the Lansing Roller Vixens will help decide the final teams to play for the D2 title. Unlike the previous two years, which had the six playoff weekends spread out over seven weeks, the 2016 playoffs won’t be taking a break. Once the festivities get under way with the Division 2 playoffs, it will be six straight weekends of WFTDA playoff roller derby. 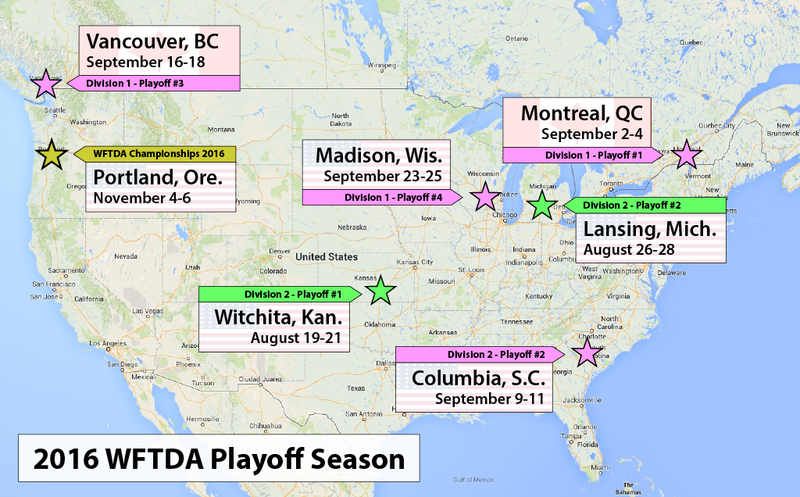 The WFTDA will be broadcasting the entire playoff run later this year on WFTDA.tv. Pricing for streaming passes will be announced closer to the postseason. There is no word yet on whether WFTDA Championships will again be broadcast on ESPN3 in the United States, or if the amount of ESPN coverage will be increasing if so. As ever, Roller Derby Notes will have full previews for all the playoff tournaments, and WFTDA Championships 2016, starting in August. August 19-21 – Wichita, Kan.
August 26-28 – Lansing, Mich.
September 9-11 – Columbia, S.C.
September 23-25 – Madison, Wis.
November 4-6 – Portland, Ore. Previous PostJantastic Invitational 2016, Day 2Next PostWFTDA 2015 Playoffs Exstataganza!